Creating the stencil detail using the template. Credit: Carol Dunne. 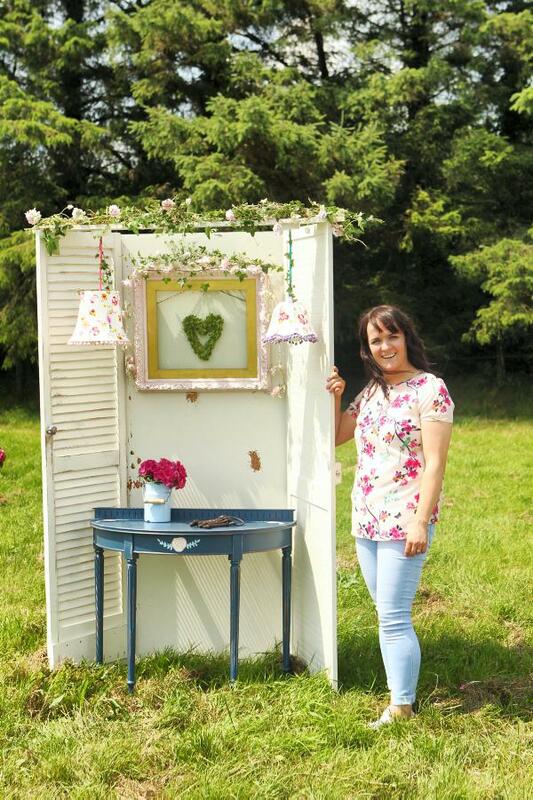 Joanne Condon of Kyle Lane with her upcycled hall table. Credit: Carol Dunne. When your table is fully dry, achieve the “distressed look” by sanding corners and sharp edges to give the table a bit of character. Credit: Carol Dunne. Stencil detail on upcycled hall table, using template. Credit: Carol Dunne. 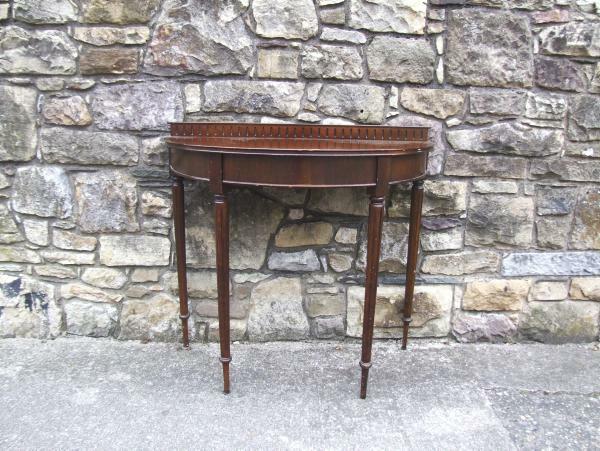 Before picture of hall table. 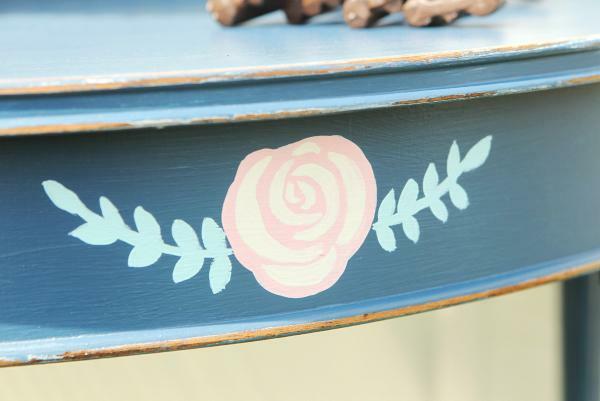 This project uses popular upcycling techniques, such as stencilling and distressing, to give an old hall table a new look. • Medium or fine-grain sandpaper. • Water-based primer (I used Farrow & Ball interior wood primer and undercoat). • Water-based paint (I used Farrow & Ball estate eggshell, stiffkey blue 281, arsenic 214, Nancy’s blushes 278, blue ground 210 and clunch 2009). • Bristly brush for stencilling. 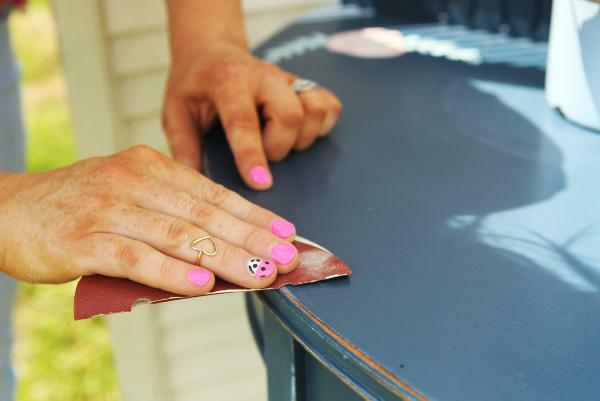 In a circular motion, sand the table with medium/fine-grain sandpaper. Wipe off any dust from sanding with a dry cloth. Prime the table using a water-based primer and undercoat. Paint in a colour of your choice with two to three coats of paint, allowing them to dry between each coat. Print the full-sized stencil template. Print out the templates and trace out each section onto a piece of heavy card or acetate. With a sharp blade, cut out each colour on a separate acetate. Apply Template 1 with masking tape to the area of your table you want to place the flowers on (this is to make sure the stencil won’t move while you are painting). Start with the largest colour first (Template 1) and work your way to the smallest. 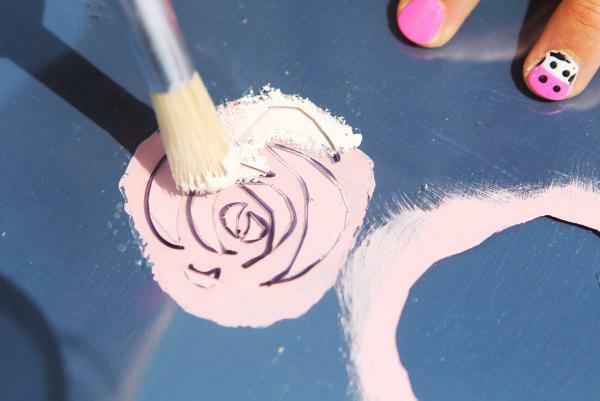 With the bristly brush, dab the paint into the stencil until it’s covered in an even coat and leave it to dry fully. Remove the stencil and tape down Template 2 to the table and repeat steps seven and nine with colour. Repeat steps seven and nine with the third stencil. With a small brush, correct any mistakes and sharpen up the stencil design. When your table is fully dry, achieve the distressed look by sanding corners and sharp edges to give the table a bit of character. Be careful not to get too “sandpaper happy”. Less is more.